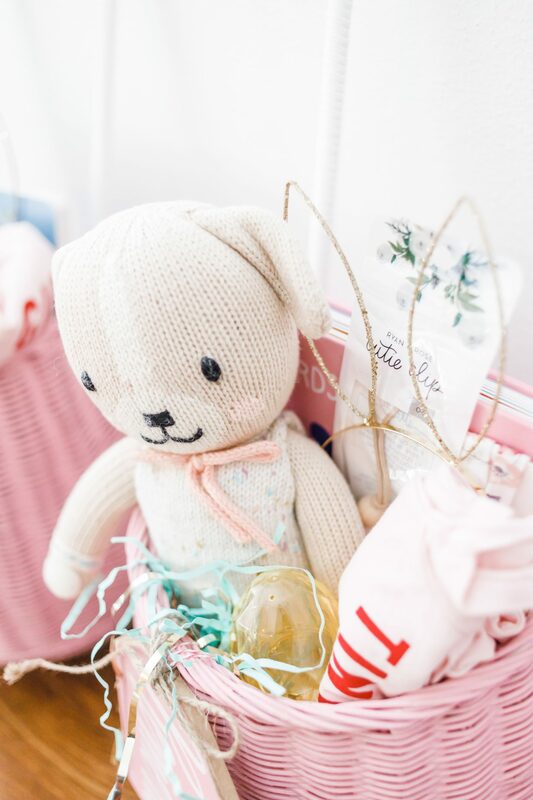 Aaah, Easter baskets!!! One of my favorite traditions to put together each year, I get way too excited about this sort of thing + plan to do this for my kids forever. 🙂 I usually do not have them done this early on, but I teamed up with one of the sweetest small shops on name tags for the girls and it got me motivated to get my act together. Now to see if I can keep them hidden for the next few weeks! 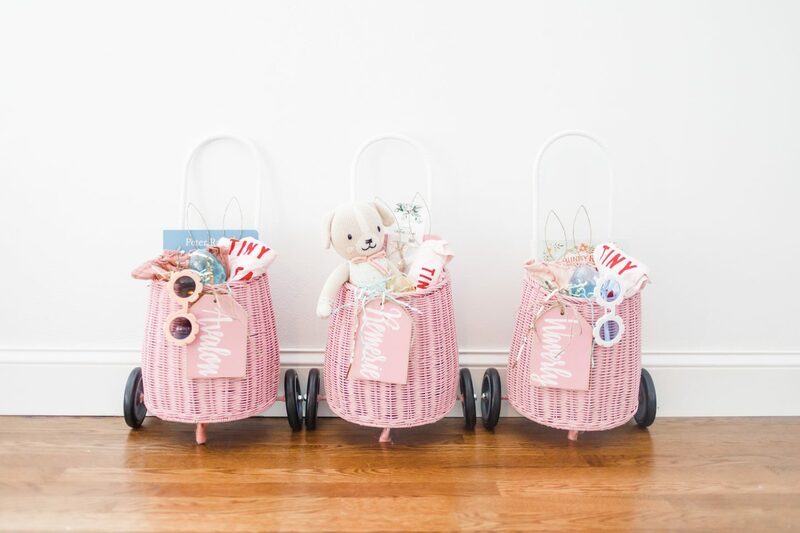 Waverly + Avalon had baskets already, but I really wanted all three babes to have matching ones and I had these three that I had gotten them for Christmas during a big sale, so they worked perfectly. 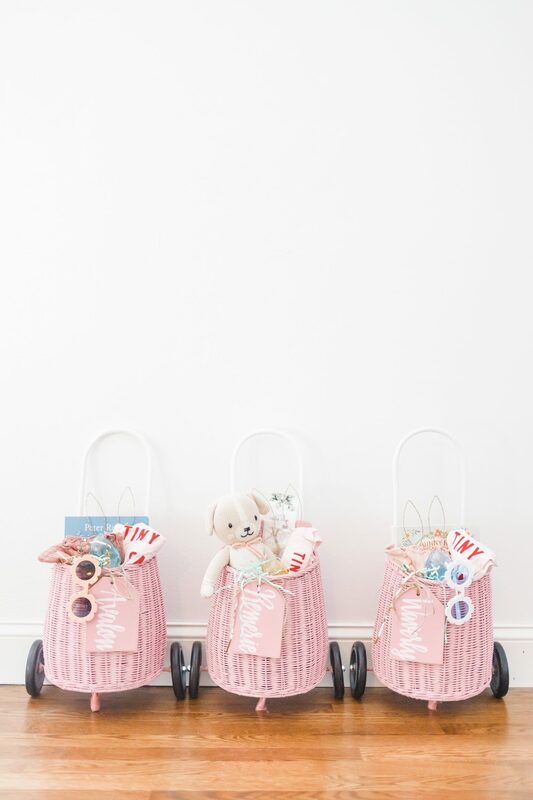 They are a little expensive at regular price, but my girls love them and play with them all the time, plus they get bonus points for being super cute decor for their playroom as well. 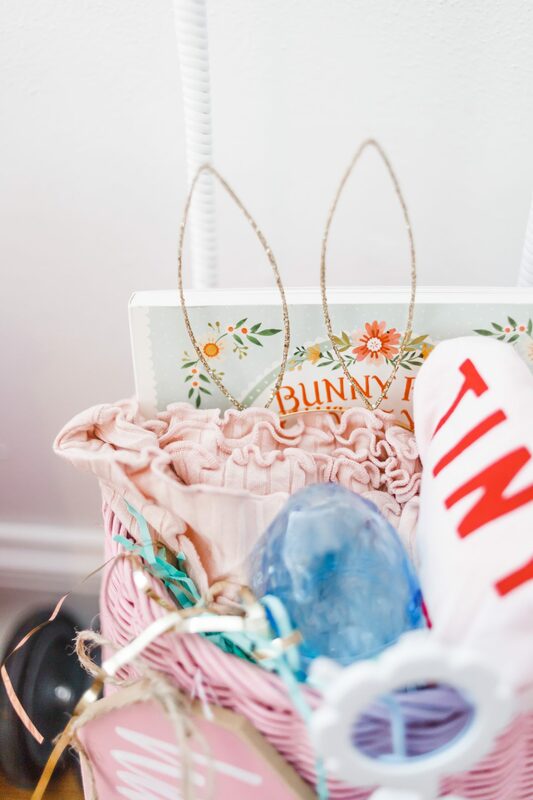 Each year for Easter baskets, I like to stock up on some spring accessories, a fun tee, new pajamas or a bathing suit, and a book for each of them. At this point we have soooo many books, but it’s the one thing I never ever feel guilty about buying more of, I plan to pass them down to each of my girls for their own kids to have one day. I also like to pick one fun little “toy” for each babe, whatever they are currently into, Waverly got an LOL doll, Avalon Peppa Pig, and Remerie got a new teething toy. I also added a new doll for Remie from our favorites Cuddle + Kind, the big girls each have one of their own on their beds so I wanted her to have one, too. I will add a few pieces of candy for their eggs the night before, but they have SO MUCH candy during that time of year anyways, I like to keep it way light. And the labels, they are so cute + so well-made! I am super excited about these and plan to use them for other things through out the year as well. They are from Chalk Designs by Me and you can still order to get them in time for Easter, all the way through April 9th. 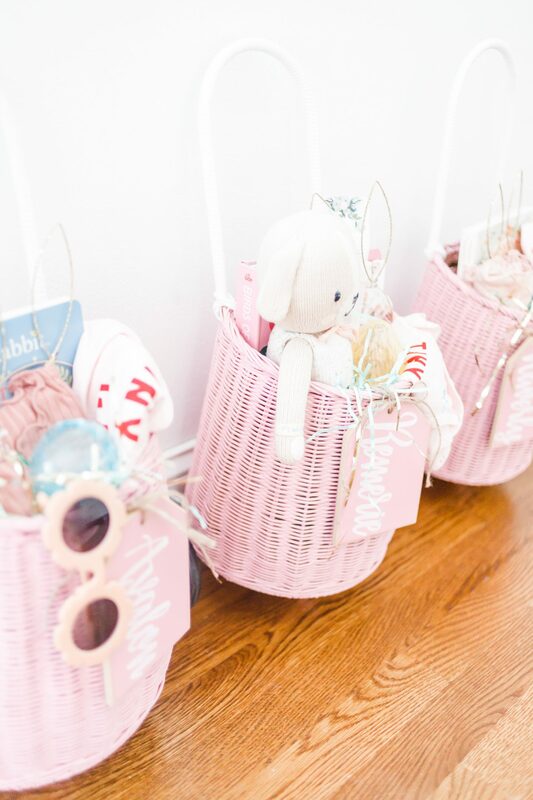 These Easter baskets are absolutely adorable! 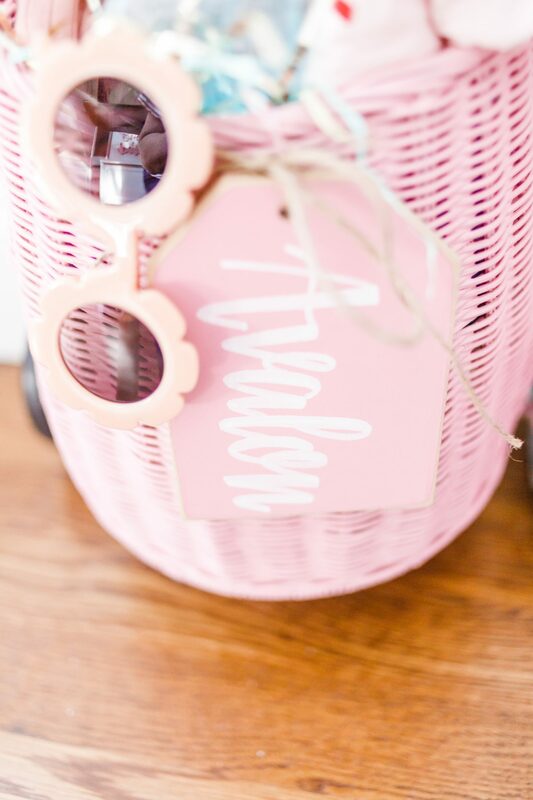 I love the baskets that you’re using too; so cute and functional!